Maybe you are new to archery, or maybe you aren’t but you are just looking for something new to try, no matter which this article will go through all the different types of archery you can find on offer today, who each one is good for and the types of bow most commonly used. After you’ve read this you should know the difference between a 3D, flight, clout, ski, and target archer! At least that’s the idea…. Targe﻿﻿t archer﻿﻿y is the style of archery featured in the Olympic games and can be practiced both indoors and outdoors and is probably the most popular one. It’s also the style you’ll come across more than any other. Probably because it is easier to setup an indoor or outdoor target range than anything else. Target archery consists of shooting an arrow at a stationary target with a gold or bullseye in the center. Other types of target can be used recreationally, however the gold centered WA bullseye target you can see below is the most common and the most widely known. The WA target (World Archery) used to be known as the FITA target (Federation Internationale de Tir a). FITA is still how you will see it referred to on many websites and online shops. A bullseye or central gold ring shot is worth 10 points and usually as shown in the image above and the further the target ring is from the center of the target consequently the lower the score. ​Olympic archery is target archery over 70m (230 feet) using a 122cm WA (FITA) target for both women and men and also there are team events, however only the recurve bow type is allowed. No other style of bow is featured in the Olympics. 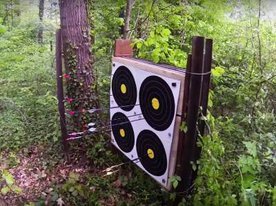 ​Field archery is an outdoorsy version of target archery practised along a course, usually through woodlands or uneven terrain, where archers find stationary targets setup at different distances and elevations. This differs from plain target archery as it introduces more distractions and variables into the shot because archers must shoot uphill and/or downhill at targets at sometimes unmarked distances with differing wind, light and shade conditions. 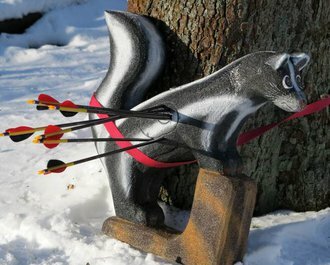 ​A typical field archery course is setup with 48 targets, 24 targets which are marked with the distance to the target and another 24 which aren’t marked. Three arrows are shot on each target to make a total of 144 arrows. 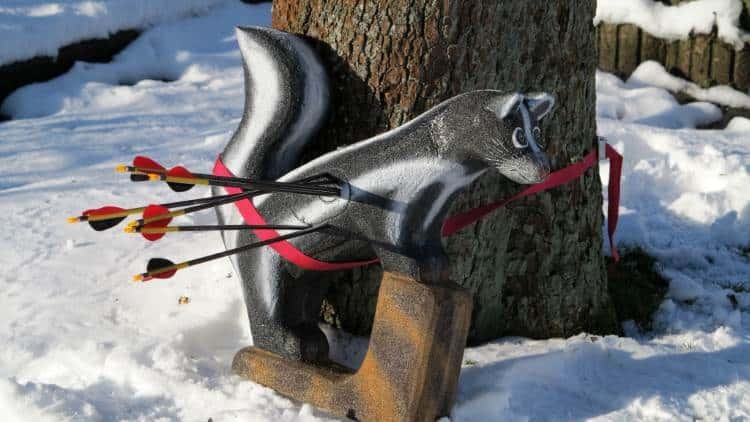 Similar to field archery, except using 3D targets which resemble animals like deer or coyote (or in the case of the example on the right a Skunk), is 3D archery. This type of archery again takes you through different types of terrain and combines a hike with judging distances, elevations and wind conditions and shooting your bow accordingly. This makes 3D archery perfect companion sport to bowhunting as it teaches many of the same skills used out in the wild. Targets in 3D archery normally have marked scoring rings to allow you to compete against fellow archers and see who has the most accurate shot. A typical 3D tournament will consist of shooting 40 arrows at 40 different targets over the course of one or two days. Clout archery is similar to target archery, however the target is much larger and is marked out flat on the floor with a flag as the bullseye. The object of the discipline is to shoot and arrow upwards in an arc towards the target, so that it drops as close to the flag as possible. The best way to think of this would be…. golf for archers (where every hole is a par 1)! Good for: All skill levels, bored golfers! 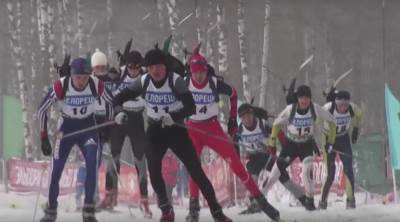 In the biathlon contestants ski through a cross-country trail system which is divided into shooting rounds (with a rifle) at targets, and if the target is not hit the bi-athlete receives a time penalty. Ski archery works in much the same way but replaces the rifle with a bow and arrow. A typical course is 12 kilometers long for men and eight for women. Four arrows are shot every four kilometers and half of those from a kneeling position. ​Ski archers normally carry their bows around the course on their back (as shown in the picture). Run archery is similar to Ski archery however the contestants run around a long-distance track or course rather than ski. This is the version of Ski archery for warm countries without snow! Traditional archery is archery stripped back to basics, no modern accessories and aids such as stabilisers, or sights and the type of bow used is normally either a modern basic bow or an old style longbow or flatbow. This type of archery is the most ‘authentic’ and the closest you can get to archery performed in days of yore. You’ll hear traditional archers call ‘trad’ archers. When using a traditional style of bow such as a longbow without fitments for a stabiliser or sight you’d just call this traditional archery, but when a modern bow is downgraded and all the aids are removed you’d refer to this as barebow. Good for: Robin Hood, Katness Everdeen wanabees! A crossbow can be used for any of the disciplined mentioned above, however crossbow target shooting has an international governing body of its own, the International Crossbow Shooting Union (IAU), and world, continental and international championships across disciplines such as Field and Match. Match competitions are target crossbow archery competitions over 10m and 30m distances and the field variant of the sport is similar to field archery where the competitors are tasked with differing target elevations, wind conditions and known and unknown target distances. ​If you live in a place where hunting is popular, there is nothing like getting out into the wild, or down to the lake and hunting your own food using a bow and arrow. Some hunters shoot fish with their bows, and are known as bowfishers and have a specially adapted fishing reel attached to the front so that after the arrow spears the fish they can reel it in. The sport of archery is open to everyone and Para archery is archery for wheelchair and/or physically impaired athletes. The Olympic and World competition events have different classification levels for different levels of competitor impairment similarly to other sports such as Open, W1, and Visually impaired V1/2/3. ​A mounted archer is an archer on horseback, in olden days this discipline would have been key within an army as a cavalryman would have found the bow an invaluable weapon to shoot the enemy from distance before engaging with him. Today it is still a practiced discipline, but places to practice are harder to find than other types of archery. 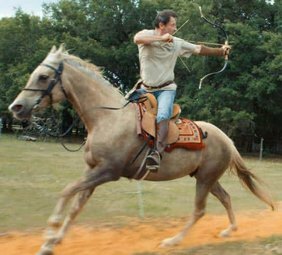 Competitive mounted archery targets do not normally exceed 45m in distance from the rider. Good for: People who like horses AND archery! A modern take on a safe way to shoot your friends (or enemies) safely with a bow and arrow without causing serious injury! Archery tag uses specialised arrows with large foam heads and participants wear protective headgear, arm guards and can hide in inflatable bunkers and other paintball style obstacles and are let loose within a confined (usually enclosed) area to shoot at each other. Think paintball, or laser tag with a bow and a big foam headed arrow! 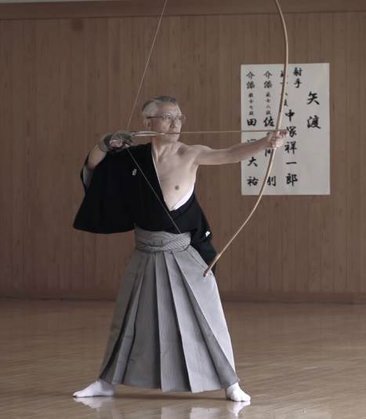 Kyudo means ‘The Way of the Bow’ and is a Japanese martial art centered around the bow. Kyyudo is practiced as a method of physical, and spiritual development. It is based upon kyujutsu (meaning ‘art of archery’) which originated with the samurai class of Japan. Practitioners of Kyudo used the yumi which is a 2 metre high bow (taller than the archer) made of bamboo, wood and leather traditionally using techniques unchanged for centuries. As with many martial arts there are various different schools of thought around the correct way to practice, some lean towards marksmanship as the ultimate goal, others towards spirituality and technique.